Nnamdi Kanu founded the Indigenous People Of Biafra (Ipob) in 2014. The movement wants a group of states in south-east Nigeria, made up mainly of people from the Igbo ethnic group, to break away and form the independent nation of Biafra. The plan is not new. In 1967 Igbo leaders declared a Biafran state, but after a brutal civil war, which led to the deaths of up to a million people, the secessionist rebellion was defeated. But the idea of separatism has bubbled away since then and Mr Kanu is the latest in a line of Biafran activists taking up the cause. He was a relatively obscure figure until 2009 when he started Radio Biafra, a station that called for an independent state for the Igbo people and broadcast to Nigeria from London. Though he grew up in Nigeria's south-east and went to the University of Nsukka, Mr Kanu moved to the UK before graduating. 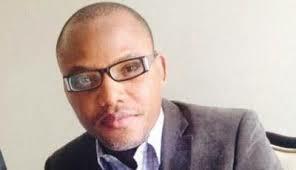 Soon after setting up Ipob, he spoke to gatherings of the large Igbo diaspora, calling for Biafran independence. In some of his comments, he urged Biafrans to take up arms against the Nigerian state. "We need guns and we need bullets," he said in one such address. And that is what brought him to the attention of Nigeria's security services. However Ipob spokeswoman Amarachi Chimeremeze told the BBC this was not a literal call to arms: "That was a metaphor, to tell the people we are going to fight for this." If his trial, currently due to begin in July, does actually get underway, that is the question the judge will have to rule on. In October 2015, soon after arriving in Nigeria for a visit, he was arrested in his Lagos hotel. He was charged with "criminal conspiracy, intimidation and membership of an illegal organisation" - charges that could amount to treason. His lawyer, Ifeanyi Ejiofor, told the BBC that the charges were "frivolous". "They were concocted to ensure his detention in prison. These are smoke-screen charges that will never see the light of day." Since his arrest, groups of Ipob supporters have gathered in protest around Nigeria and the movement has gained momentum. They believe that the British vote to leave the European Union and Donald Trump's election in the US are evidence of growing international support for the "right to self-determination" which they espouse. Some have said they are now seeking "Biafrexit". Organised pro-Biafran protests have almost always been broken up by police, with Ipob saying their followers were injured or even killed, something the authorities vehemently deny. But the violence has led to increased publicity and Cheta Nwanze, a political analyst who has done extensive research on the pro-Biafra movement, says Mr Kanu's "arrest was a mistake because it played into his hands". "When the 2015 election happened, there was a slowdown in the popularity of his radio station and that's when he decided to come to Nigeria to get arrested." Was it a mistake to arrest Nnamdi Kanu? Mr Nwanze believes Mr Kanu is an opportunist and points to a video of him speaking at an anti-Boko Haram rally in London just months before he set up Ipob, where he spoke about the need to protect Nigeria from breaking apart. But the Ipob spokeswoman disputes this. She says Mr Kanu simply went to Nigeria to show his commitment to the struggle. "He came to prove to them that he meant everything that he said. The Nigerian administration were acting as if according to a script and arrested him," Ms Chimeremeze told the BBC. Putting his separatist ambitions aside, human rights groups and some senior politicians have been calling for Mr Kanu's release, arguing that his many months of detention without trial was unlawful. As is common with the Nigerian legal system, the case has been plagued by delays. After a year-and-a-half, no significant progress has been made. The government ignored several court orders calling for Mr Kanu's bail before bowing to a court order last week, and granting it "on medical grounds". But the bail conditions are harsh: The Ipob leader is banned from public speaking, granting interviews or being in a group of more than 10 people. As a condition of that bail Mr Kanu had to bring a prominent Igbo leader, a wealthy resident of Abuja and a senior Nigerian Jewish leader to provide 100m naira ($260,000; £200,000) each as surety to the court. The Ipob leader says he is an Igbo Jew, part of a group who believe they are descendants of the lost tribe of Israel who settled in West Africa. It is hard to judge the real strength of a movement like Ipob and its leader. While the misery of the Biafran war put an end to the separatist ambitions of many Biafrans, a lot of Igbo people still feel that they are not fairly treated in Nigeria. And some argue that President Muhammadu Buhari is doing little to help that. After all, he was a soldier in the army that defeated the separatists in 1970. Vice-President Yemi Osinbajo, on the other hand, was recently celebrated for opening a conversation on what happened during the Biafran war. What happens to Mr Kanu and Ipob next is not clear. The movement may go the way of Massob (Movement for the Actualisation of the Sovereign State of Biafra), an earlier separatist movement. Massob lost some of its influence after its leader was jailed in 2005 and released two years later. This year marks 50 years since the Biafran war began. What the interest in Mr Kanu and his movement shows more than anything else is Nigeria's 50-year failure to put the idea of Igbo separatism to rest.